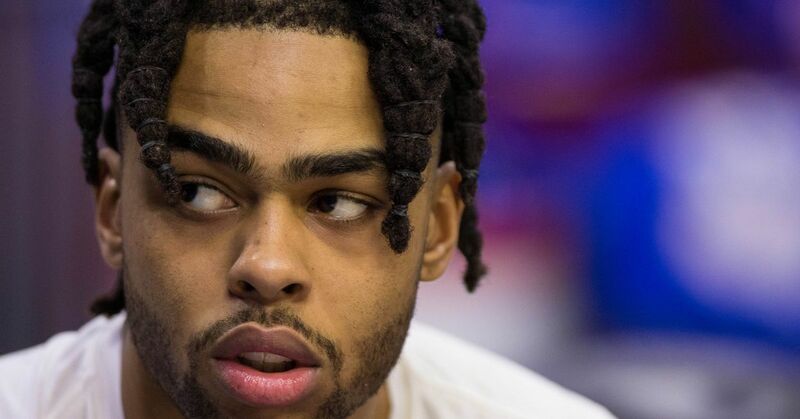 Is D'Angelo Russell Worth Max Money to the Nets or Anyone Else in Free Agency? LOS ANGELES — It's somehow fitting that D'Angelo Russell and the Brooklyn Nets officially eliminated the Los Angeles Lakers from playoff contention Friday night at Staples Center with a 111-106 victory. The Lakers gave up on Russell before the 2017-18 season, sending him along with Timofey Mozgov's bloated contract to the Nets for Brook Lopez and Kyle Kuzma, the 27th pick in the 2017 NBA draft. By shedding Mozgov, the Lakers opened enough spending power to sign two max stars this past summer, but outside of LeBron James, the extra space was superfluous, used to sign one-year veterans Rajon Rondo, Lance Stephenson, Michael Beasley, JaVale McGee and Kentavious Caldwell-Pope. Kuzma is one of L.A.'s best players, but he probably would have still been on the board for the Lakers. They had the No. 28 pick in the same draft and instead used it in a trade with the Utah Jazz for Josh Hart (30th) and Thomas Bryant (42nd). "D'Angelo is an excellent player. He has the talent to be an All-Star. We want to thank him for what he did for us," Lakers president Earvin "Magic" Johnson said at the time, per ESPN's Baxter Holmes. "But what I needed was a leader. I needed somebody also that can make the other players better and also [somebody] that players want to play with." Johnson was correct about Russell's talent. The 23-year-old guard made his All-Star debut in Charlotte last month, but Russell has also proved to be a capable leader as the best player on the 38-36 Nets, likely one of the eight playoff teams in the Eastern Conference. David Locke joins Howard Beck on The Full 48 to discuss former Lakers finding success, how D'Angelo Russell could be the NBA's biggest anomaly and more. The Lakers have struggled with injuries, but at 31-41, they could have certainly used Russell's shooting and scoring ability. Johnson questioned if others would want to play with Russell, likely stemming from a video that emerged showing former Laker Nick Young—then engaged to rapper Iggy Azalea—discussing other women. Russell, who shot the video, insisted he wasn't responsible for leaking it, but it did damage his reputation. Whether Johnson's decision was based on Russell's personality or basketball acumen—or the Lakers' desire to add established star players—the Nets have benefitted tremendously from the trade. Russell is averaging 20.7 points and 6.9 assists per game, including 44 points (27 in the fourth quarter alone) in a comeback win over the Sacramento Kings on Tuesday. Brooklyn won just 28 games last season with Russell sidelined for 34 games, primarily after mid-November knee surgery. He's been healthy for nearly the entire 2018-19 campaign, and the Nets are on the verge of their first playoff appearance since 2014-15. The timing is fortunate for Russell, who will be a restricted free agent this summer. Based on the league's current $109 million salary-cap projection for the 2019-20 season, Russell will be eligible for a contract as high as $27.3 million in the first season. He can stay with the Nets for up to five years and $158.1 million or leave to another franchise for four years and $117.2 million. Regardless, Brooklyn will have the right of first refusal. The Nets have a favorable salary-cap position this offseason. Spencer Dinwiddie's $10.6 million is the largest fully guaranteed contract, although more likely than not, Allen Crabbe will opt in to the final year of his deal at $18.5 million. If so, Brooklyn will have roughly $50 million in spending power (without Russell). Unsigned, Russell will take up another $21.1 million of the Nets' space, leaving the team with about $30 million to go star-chasing. Outside of Golden State Warriors All-Star Kevin Durant, who can sign for a contract starting at $38.2 million this summer, most of the top free agents (like Kawhi Leonard, Kyrie Irving, Klay Thompson and Jimmy Butler) will be eligible for deals beginning at $32.7 million. The Nets can near that figure if they use their first-round pick on a player who commits to going overseas for a year, or they can trade it for a future first-rounder. Brooklyn can also look to deal Crabbe outright after he opts in—or other players on the roster—although the tandem of Dinwiddie, Joe Harris, Jarrett Allen, Caris LeVert, Rodions Kurucs and Dzanan Musa combine to earn just $26.9 million. If Brooklyn can get out of Crabbe's contract via trade, the Nets would have roughly $48 million to spend while retaining Russell's rights. That's not enough for two additional maximum-salaried players, but they could add one star and still have another $16 million to spend on additional talent. If trading Crabbe proves too costly in terms of draft consideration, the Nets can waive and stretch his contract over the next three years at $6.2 million per season. That's not a preferred route, but it would get the franchise to roughly $42 million in cap space, enough to sign one max player without sacrificing any other player or draft assets. Restricted free agency is often a gamble. If the Nets are reluctant to max Russell out, can he find a top-dollar offer sheet from another team that will force Brooklyn to decide? Several teams will have cap room, and while it's unlikely Johnson and the Lakers revisit Russell, the Phoenix Suns could certainly use a point guard, and a backcourt of Devin Booker and Russell would be explosive offensively. The Dallas Mavericks might also be in the market. Russell's shooting ability would make him a nice complement to rookie sensation Luka Doncic. The Indiana Pacers may also have enough spending power, perhaps to pair him with Victor Oladipo. Once the top stars settle into new deals, teams that miss could quickly make overtures to Russell. Restricted free agents typically take a little longer to sign, partially because of the waiting period. The Nets would have two days to decide should Russell sign an offer sheet with another franchise. Gauging how much Russell will get this summer isn't easy. Eric Bledsoe recently signed a four-year extension with the Milwaukee Bucks for $70 million, but only $3.9 million of his final season is guaranteed. Bledsoe is averaging 15.8 points and 5.4 assists per game, and he's not nearly the three-point shooter (31.5 percent) that Russell is (36.6 percent) for Brooklyn. Last summer, the Chicago Bulls gave Zach LaVine a four-year, $78.8 million contract, matching the offer sheet given by the Sacramento Kings. LaVine is scoring 23.7 points with 4.5 assist per game and shooting 37.4 percent from deep. Phoenix will start paying Booker $27.3 million next season, the first year of his $158.1 million extension—the same deal Russell will be eligible for in July. Booker is averaging 25.5 points and 6.7 assists nightly but shooting just 32.4 percent from three on the woeful 17-56 Suns. Russell's salary range will probably fall somewhere between LaVine's and Booker's. The Nets will still have significant money to spend to improve their roster, especially if Crabbe opts out, is traded or waived and stretched. If the Nets can't land stars in free agency, they're still in a strong position to bolster the roster with less expensive veterans. Cap room can also be a valuable tool in a trade. The Nets might be able to land quality talent while helping other teams shed players, much like how they helped the Lakers shed Mozgov while taking on Russell two summers ago. Los Angeles sold early on Russell, banking on the team's ability to land stars, but while James was a huge get, Paul George re-signed with the Oklahoma City Thunder without even taking a meeting with Johnson and the Lakers. Aaron Mintz of Creative Artists Agency represents George and Russell, along with Julius Randle, who the Lakers also let go last July. Perhaps giving up so quickly on Russell—with Johnson publicly questioning his leadership—contributed to George's decision to steer clear of Los Angeles. Ultimately, Russell is proving his value with the Nets both as a player and leader. He will be well-compensated this summer, presumably by Brooklyn, as the franchise looks to move from a low-seeded postseason entry in the East to viable contender.